South Korean President Moon Jae-in on Thursday called for the US to swiftly resume talks with North Korea on denuclearizing the communist country, while also saying that a declaration of the end of the Korean War should happen as soon as possible. Briefing South Korean citizens on the outcome of the inter-Korean summit, the main business of which took place Tuesday and Wednesday, Moon said North Korean leader Kim Jong-un had expressed his desire to complete the denuclearization process as soon as possible and to focus on the economic development of his country. “While asking (for South Korea) to be the negotiator for the Pyongyang-Washington talks, he (Kim) vowed to cooperate for complete denuclearization. … I believe it is an opportune time to resume the talks,” Moon told the international media gathered at the press center at Seoul’s Dongdaemun Design Plaza. In the Pyongyang Declaration, jointly announced by the two leaders on Wednesday, North Korea pledged additional steps toward denuclearization -- starting with the permanent dismantlement of its Tongchang-ri missile engine test site under the observation of outside experts. He offered to do the same at the Yongbyun nuclear facility, if the US takes corresponding measures in the spirit of the June 12 declaration between the US and North Korea. The words “observation” and “permanent dismantlement,” which the North used in the Pyongyang Declaration, ultimately mean the same thing as “verifiable and irreversible dismantlement,” Moon said. He also said Kim was hoping to welcome US Secretary of State Mike Pompeo to North Korea and also to convene a second US-North Korea summit with US President Donald Trump at an early date, so as to achieve rapid progress on denuclearization. Moon noted that, unlike in the past, when the North wished to deal only with the US on nuclear issues, the two Koreas had agreed that progress on inter-Korean relations was directly linked with the success of talks between Pyongyang and Washington. Moon stressed that the declaration of the end of the war would be a “political declaration” and would not immediately mean the end of the current situation. Instead, he said, it would be the start of peace negotiations with a peace treaty as the end goal. When North Korea has completed its denuclearization process, a peace treaty can be signed, paving the way for positive relations between the US and North Korea. 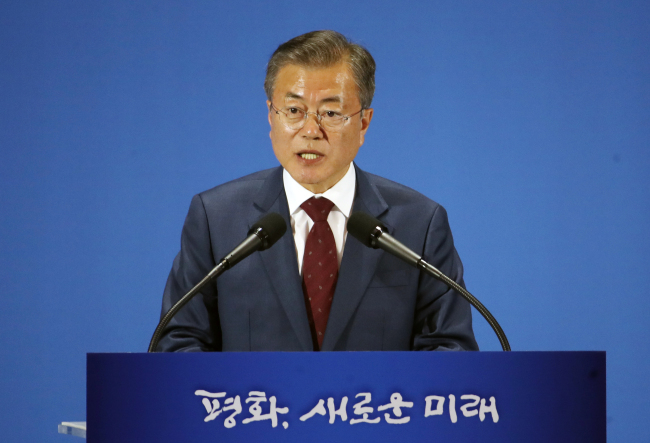 Moon stressed that the US troops are stationed here because of the Seoul-Washington alliance, and a declaration of the end of the war would not affect that. While critics said the Pyongyang Declaration lacked substantial demands for the North, Moon said he and Kim had extensively discussed measures the North would take toward denuclearization that were not included in the statement. Moon added that, ultimately, the specific measures the North will take and the corresponding moves by the US were up to Pyongyang and Washington. “I will talk about these points with (US) President Donald Trump when I meet him in the US,” he said, stating that South Korea would serve as a mediator in the nuclear negotiations. Moon is slated to meet Trump on Monday, on the sidelines of the UN General Assembly.